The biggest advantage of mobile operators – comparing to OTT applications – is that they are interconnected. No matter what country we are in we can connect into the network, we can place the calls, receive the calls, all under our own identity. We also don’t care in which network is our counterpart if he/she is now present in his/her home network or not. To achieve this operators need to support roaming and interworking. The IMS Roaming and Interworking Guidelines can be found in the GSMA IR.65 and LTE Roaming Guidelines in GSMA IR.88. We’ve mentioned the roaming when we discussed the SBC. In this post we’ll take a look on what options we have. So what can be the flows when one of the participants is not physically present in the home network and needs to be connected via some other infrastructure – the visited network. Just recently the GSMA announced the first commercial interconnected VoLTE service in South Korea. This just illustrates how far we’re still from the real IMS-based roaming. Firstly the roaming can be done in the packet core. The P-CSCF is in the home network. But that requires a mechanism which obtains the IP address of the A-SBC. This solution called S8 (reference point) Home Routing (S8HR) is very easy and maybe a bit preferred by operators these days because that’s a standard way for data roaming. However there are many open questions here related to Lawful Intercept, Emergency Calls, SRVCC, etc. GSMA works on a new variant of S8HR which is a part of the GSMA Network 2020 Programme and was recently as agreed as VoLTE Roaming candidate. In the WebRTC and IMS post we briefly described the IMS and WebRTC integration. We explained that the WebRTC allows a rapid development of clients. The clients still need some infrastructure for the signalling and services – that’s the IMS. The network element which is acting as an interface between these two worlds – the world of web and the world of IMS is called a WebRTC GW. The WebRTC GW is a collection of network functions which we need for the translation of protocols, interworking and authentication procedures. It can be implemented as an enhancement of already present elements (e.g. eP-CSCF) or we can have a new stand-alone entity. 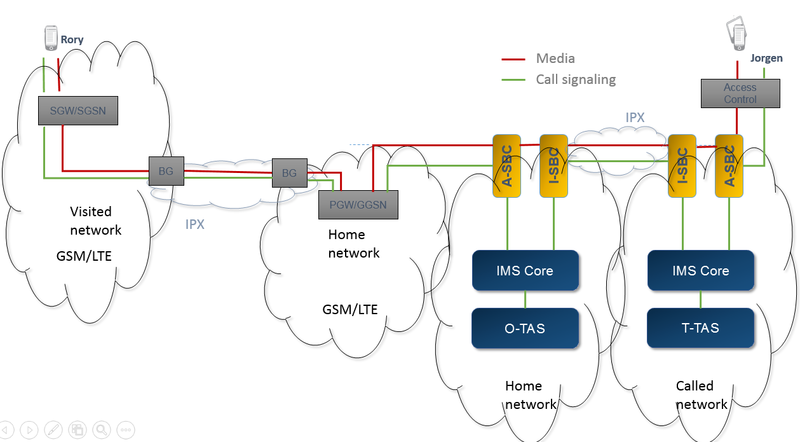 As we said the flows and procedures are described in the reference architecture for WebRTC – IMS communication in 3GPP TR 23.701 and 3GPP TR 33.871. Some new information and experience can be also found in GSMA WebRTC to complement IP Communication Services. From the high-level WebRTC GW does the translation between http/ws to SIP and vice versa. When we go a bit more in detail there are many issues which have to be addressed. It is really hard to predict the future. The authors of SIP and SDP designed (1996) a great concept which really addressed the needs of not just real-time communication for the next two decades. But they also believed the the Network Address Translation (NAT) is only a temporary solution which will be obsolete once everyone will use IPv6. In 2015 we still use the NATs and I’d think (! the same mistake again) that we’ll use it for a couple more years. NAT is technique which became in conjunction with IP masquerading a popular as an essential tool in conserving global address space allocations in face of IPv4 address exhaustion. These days the NAT is used also for security reasons e.g. topology hiding, port and IP restrictions etc. The basic functionality of NAT is to translate one IP into another. Typically we can found NATs which mask behind one public IP a whole private network (one-to-many NAT). The traffic then can originate only from the private network (private IP space is not directly addressable from the public network). Why we care about the NAT anyway? And what’s wrong with the SIP? Right. Let’s remind that the SIP+SDP are used to establish a media session. It means we’re exchanging IP addresses of the originator and recipient which will be then used for (e.g. RTP, MSRP) data stream. These IP addresses are in the SIP body in the SDP content. The media communication is then established on these IP:ports. As the addresses and ports are private the other clients can’t use them as they don’t see each other. For supplementary service configuration, the UE and IMS core network must support XCAP at the Ut reference point as defined in 3GPP TS 24.623. Wow – this is very important! 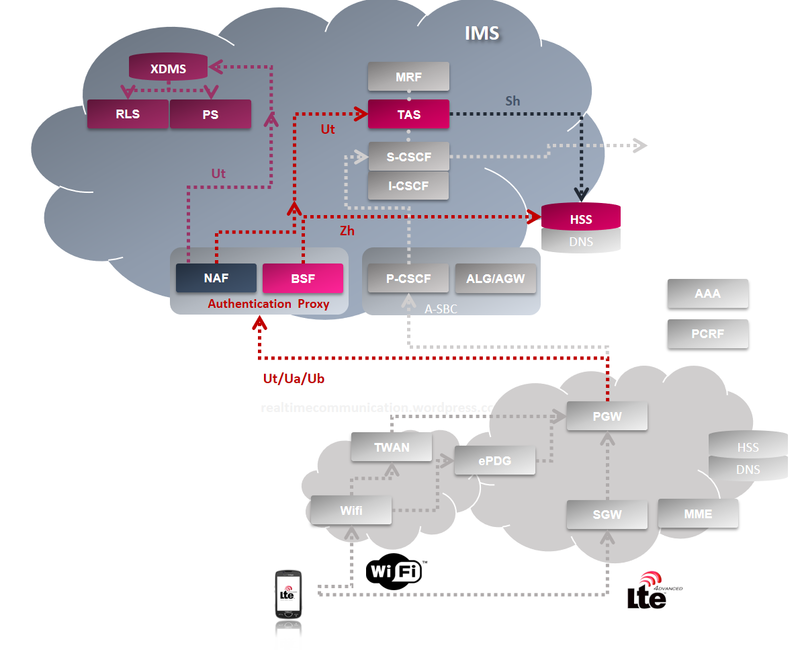 There is not only the SIP/RTP between UE and IMS network but there can be also http (xcap)! Unlike SIP, HTTP is designed as a general-purpose data transport protocol. The purpose of SIP is mainly to create, modify, or terminate multimedia sessions. But sometimes we want to work with other types of data (e.g. configuration data, presence data, ..) which could easily overwhelm intermediate SIP proxies. HTTP is a good choice how to solve this issue. What is the network architecture then? As we can see the http traffic does’t go through the SBC but through an Authentication Proxy (AP) instead. Its main purpose is to authenticate user requests. It is also used to separate the authentication procedure and the Application Server (AS) specific logic (e.g. Supplementary Service provisioning) to different network entities. IR.92 also says that for supplementary service configuration, the UE and IMS core network must support XCAP at the Ut reference point as defined in 3GPP TS 24.623. The supplementary services are applied on the traffic by application server (MMTel) based on the information received from HSS/CNTDB (Sh/LDAP). Note we distinguish the originating and terminating services (based on presence of the ‘orig’ tag in the top-most Route header). We also distinguish weather or not is the user currently registered in the LTE network (based on the ‘regstate’ tag in the P-Served-User). E.g. some services are applied for recipients (terminating service) who are not present in the LTE (regstate=unreg) – as voice mail. More details can be found in the 3GPP TS 24.229.